French duo Space Megalithe, comprised of Jean-Claude Gil & Christophe Barbier, debuted during November 2014 with their self-released "Psyché Energy" CD. One year later they participated in Belgium (Heusden-Zolder) on B-Wave festival's main stage with names such as Robert Rich, Radio Massacre International and The Tower Free. A quite good opportunity to reveal their talents. Btw, a nearly 70-minute long recording from their performance is available in digital formats through Space Megalithe's Bandcamp site. 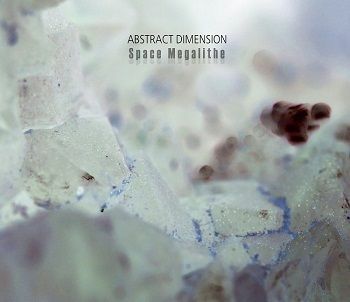 Although I have followed all these significant events, it was Space Megalithe's second album "Abstract Dimension", which has really triggered my interest in this emerging project. So I can't forget to send kudos to kindred soul Sonic-Hypnosis for his hint!!! "Abstract Dimension" was released during January 2016, again as a glass mastered self release packaged in a traditional jewel case with 4-panel front cover insert. Another French soundscaper (and anthropologist) Boris Lelong is credited for his participation on the album's art concept. Nearly 10 minutes long title composition "Abstract Dimension" unfolds this stellar odyssey with grandiosely expansive washes, perpetually drifting and ebbing, and intriguingly illuminated by intangibly gossamer clinks, lushly swirling fragments and enigmatically immersing biotic undercurrents. A top-notch intro, messieurs!!! Then follows a live, 11-minute version of "Psyché Energy", the title track from Space Megalithe's debut album. Cybernetic shimmerings are soon permeated by translucent sequences painting delicately elevated rhythms, exquisitely polished and euphorically sharp, while soothing tides of atmozones are persistently guarding above. Magnifique!!! So no wonder I didn't even notice a seamless transition to "Crystal Landscape 1", which inconspicuously moves into gorgeously nuanced panoramic vistas. A warmly encircling sonic postcard! "Crystal Landscape 2" clandestinely sneaks in, but the center stage is soon stolen by gently pulsing beats, meticulously bridging glistening cybernetic mesmerism with fascinatingly yearning undulations. Awesome bundle, bravo, Jean-Claude & Christophe!!! "Temple Of Andromeda" delves deeply into ambiguously colored terrains, where perplexingly labyrinthine drones precisely coalesce with variety of ear-tickling, industrial-infused traceries, organic glimpses and eerie curtains. Abstract soundforging at its finest!!! "Betelgueuse Station B" keeps at the beginning safely on the bizarre path, but over the course the track slowly metamorphoses into spectacularly immense spacefields, stunningly panoptic, yet enthrallingly piquant. The closing 3 minutes are masterfully magnified by crystalline sequencer meridians. A truly phenomenal piece clocking to 11-minute mark and an exuberantly creative pinnacle so far! Merci beaucoup!!! The next piece, "Waves", with 6 and a half minutes the shortest one on "Abstract Dimension", glides through balmily poetic vastness, where profoundly evocative meanders magnificently commingle with engrossingly ephemeral stillness. A genuine tranquilizer! "Stone Alignment", a 12-plus minutes long composition closes this amazing sonic voyage with expanding tides coupled with transient field recordings, both balsamic and spectral, unlocking the gates of jaw-droppingly monumental horizons. These spellbinding layers are delightfully counterpointed with evanescent trimmings of primordial artifacts, while remotely mesmerizing (heart)beat surreptitiously percolates through. A very strong finale indeed! 77-minute "Abstract Dimension" is a highly accomplished recording by this gifted duo, fully revealing their ingenious insignias, when sophisticatedly amalgamating North-American flavored atmospheric soundscaping with unpredictable Berlin School ingredients. Space Megalithe is a really big revelation from France, no question about that!!! And not only "Abstract Dimension", but also their first album "Psyché Energy" is highly recommended!!! And even if still newcomers, deep respect to Jean-Claude & Christophe for not being afraid of self-releasing their music on a glass mastered format. It's a quite rare move these days. So keep on creating, guys, I certainly stay tuned for all your future spatial installments! Once again, a big round of applause to Space Megalithe!! !